Portugal, a small nation located on the edge of Western Europe, on the Iberian Peninsula. Portugal's only land border is with Spain, and the rest of its borders are along the Atlantic Ocean. Portugal also includes the Azores Islands in the middle of the Atlantic Ocean as well as the islands of Madeira. Portugal covers an area 92,212 square kilometers (35,603 square miles), and has a population of about 10.5 million. 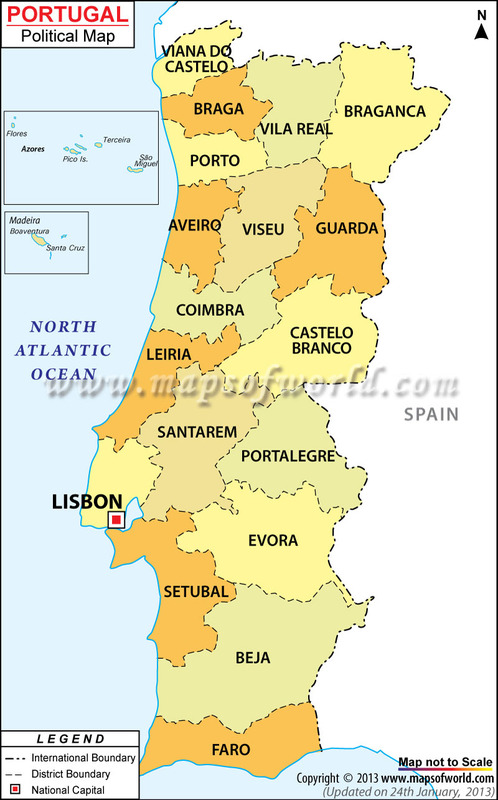 Mainland Portugal has eighteen districts: Aveiro, Beja, Braga, Braganca, Castelo Branco, Coimbra, Evora, Faro, Guarda, Leiria, Lisbon, Portalegre, Porto, Santarem, Setubal, Viana do Castelo, Vila Real, and Viseu. The capital of each of these districts is a city of the same name. The Azores Islands and Madeira are considered autonomous regions of Portugal. The Azores Islands are an archipelago in the Atlantic Ocean. There are nine volcanic islands in this chain, Flores, Corvo, Graciosa, Terceira, Sao Jorge, Pico, Faial, Sao Miguel, and Santa Maria. The Madeira Islands include Madeira, Porto Santo, and the Dessertas and Savage Island groups. The Madeira Islands are also volcanic islands.